(NaturalNews) Many nutritionists consider the avocado, which is native to the region stretching from the central highlands of Mexico to the Pacific Coast of Central America, to be one of the healthiest fruits in the world. This is because, unlike most other fruits, these green-skinned, single-seeded berries are rich in beneficial fats that are proven to boost our health in countless ways. However, avocados are also bursting with many other nutrients lacking in the Western diet, making them an excellent "all-round" food for correcting deficiencies and tackling diseases. This article takes a closer look at the health benefits of this often misunderstood fruit, which deserves far more attention in the Western world than it currently receives. Avocados contain certain plant sterols, such as beta-sitosterol, that possess antiestrogenic properties, meaning they can block the estrogen receptors in our cells and reduce estrogen absorption rates. Consequently, progesterone levels in women and testosterone levels in men are increased. (4) This makes avocados an especially valuable food in today's world of widespread pollution and gender-bending chemicals, which can greatly compromise endocrine function. One American avocado supplies our bodies with approximately 33 percent of our recommended daily allowance (RDA) of vitamin C, 53 percent of our RDA of vitamin K, 28 percent of our RDA of potassium and similarly high amounts of other beneficial nutrients such as vitamin E, manganese, magnesium and most B vitamins. 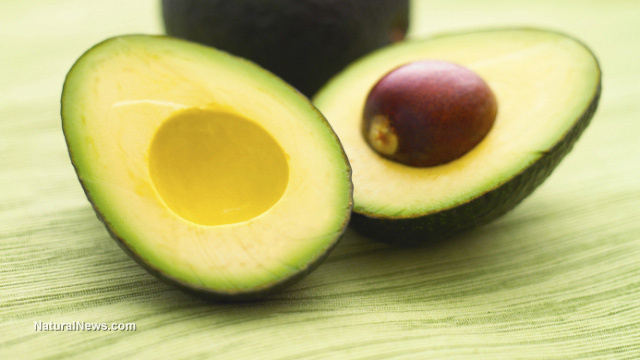 Additionally, one avocado contains a whopping 13 grams of dietary fiber, which is over 50 percent of our RDA. (7) This is far more fiber per weight than most other fruits, making avocados one of the best foods for treating constipation.